It is well known that from the early years when Hardys began the manufacture of fishing reels – that they would produce any item to order for their clients. The only criteria being that the client should meet the cost of the article’s production or modification. Where these requested variations resulted in worthwhile improvement to the reel with potential for economic advantage in the market place – Hardy’s would often produce the reel in quantity and give to it the name of the person from whom the suggested change had originated. The ‘Barton’ and ‘Davy’ reels are just two examples of this policy. More importantly, certain of these customer requested variants did not continue into the general production output – presumably because it was thought that no commercial benefit would result from their inclusion. The reel which we have to show readers of the ‘Antique Tackle Observer’ on this occasion demonstrates this policy of Hardy’s precisely. 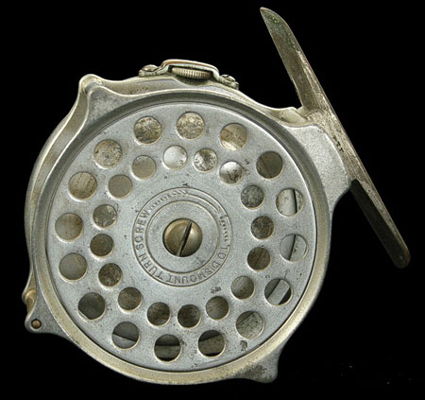 The Perfect reel shown dates from around the period of 1904/5 and has been manufactured as a Left Hand Wind reel which makes it extremely rare. Photo It is the earliest all alloy Perfects we have yet seen produced as a true LHW. Its existence confirms that Hardy’s would produce a LHW reel to satisfy a customer request at any time during the last 100 years but that LHW was not considered to offer any commercial potential and so the principle of LHW reels was never exploited. This statement must be viewed from the standpoint of his many years as an auctioneer during which time he has handled many thousands of Hardy’s Perfect reels. It is perhaps pertinent to remind readers that the scarcity of LHW Perfects and their desirability amongst collectors, has led to numerous fakes being produced and sold on ebay. A growing number of collectors are now aware of these forgeries and to those not yet acquainted with them – beware. All LHW Perfects claiming to be pre 1954 should be approached with caution, viewed with suspicion, and where possible a second opinion should be sought from someone sufficiently knowledgeable to give it. Otherwise that pride of place amongst your collection could be occupied by an expensive – but worthless – piece of junk ‘manufactured’ in someone’s garden shed. However, important though this particular reel is for its LHW configuration, it has another – perhaps even more important reason for being the subject of this article. Many readers of this magazine will understand and agree with one of the Antique Tackle Observer’s aims – which is to publish all manner of information regarding fishing tackle. Some of the information will be new and unknown, some old and widely available, some important, and some perhaps less so – but all of interest to its worldwide circle of readers. Whilst it is true that not everything appeals to all subscribers all of the time however new or important it might be, what the content of the magazine does achieve is the recording and widespread dissemination of knowledge to – and amongst – the collecting fraternity. This ensures that information is recorded and preserved for those who come after us who will also seek answers which perhaps cannot be found elsewhere. With this said we can now show this little known variant of the Hardy alloy Perfect – a LHW reel fitted with a tapered spindle. As far as we can determine this variation was never catalogued, but discussion with a long serving member of Hardy’s staff confirmed existence of this spindle was known and that the taper was two degrees. 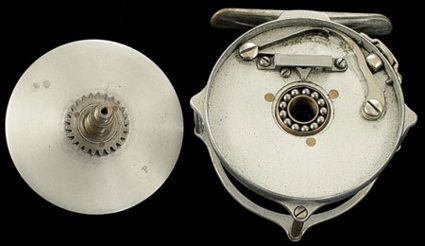 It seems that very few reels were ever fitted with this design of spindle which suggests it may have been an experimental exercise which was quickly discontinued. Because the reel in which it is fitted dates from around 1904/5 it is reasonable to assume the spindle dates from around that period. 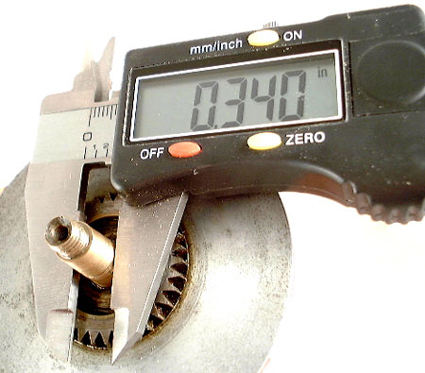 Whilst the principle of tapered spindle/shafts running in tapered bearings is well understood – it is difficult to see what advantage it would confer to a fishing reel. It may well have reduced wear – and provided for minor adjustment of worn components, but given the production methods and machines of the day – would certainly have been more expensive to produce and would presumably have made the interchange of drums between reels fitted with the parallel spindle impossible. 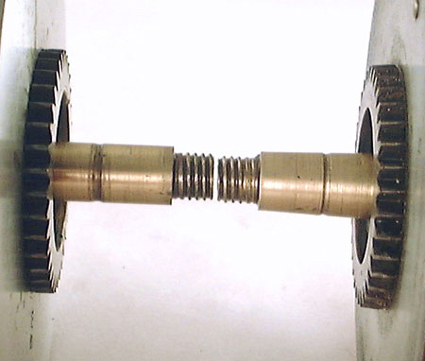 Just why the tapered spindle was introduced – or abandoned – may never be known, we do know that it is excessively rare as all other authors on the subject of Hardy’s Perfects seem to have overlooked it. However, it does show yet again the effort which Hardy’s put into their policy of continuous development to ensure the Perfect was as good as it could be made. The question the discovery of the tapered spindle now poses for us all is ‘what other curious but short lived modifications made by Hardy’s are still out there waiting to be found by an unsuspecting collector, and shall we ever really know all there is to know about this most perfect of fishing reels’? A more immediate question must be – was the tapered spindle fitted to other sizes of the narrow drum Perfect and was it also used in the wide drum Salmon reels? Readers who have collections including Perfects should check their reels for this variant – it shouldn’t take long as it was probably restricted to a small number of reels dating around 1904/5. Any discoveries should be reported to the Editor who will I’m sure welcome any additional information the readers can provide. 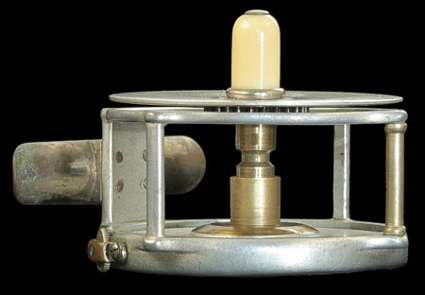 When I wrote the above article – following the discovery of a little known Hardy reel component variation – the “Tapered Spindle”. I had hoped that the Hardy reel collecting fraternity would report the existance of multiple examples from amongst their own collections. It was hoped information would be submitted in sufficient quantity and from so many different sources that we would be able through this research to define the year in which the the “Tapered Spindle” first appeared and the year when it was discontinued. It was also hoped that evidence of its fitment to differen Hardy reels would also emerge. Alas, this has not (as far as I am aware) happened. My own further research discovered only one other example. This second example is important because it tells us that the “Tapered Spindle” was not a short lived experiment to be discarded as a failure shortly after its introduction. 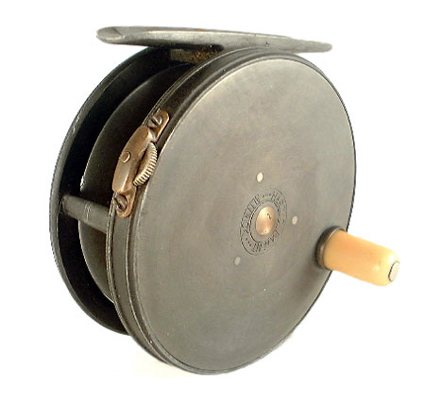 The reel in which this further example was found is a 1912 Bougle which is pictured below. So, far from being abandoned very quickly it is now confirmed as having a life span of some five years, and It is useful to note that Hardy’s usually introduced changes to their reels aproximatelly every five years. This must mean that there are very many more reels built with this spindle than previously thought. The question is where on earth are they – and what was the intended purpose of their design – and finally, why was the design deleted? It is here that we can begin to speculate possible reasons for the introduction of a revised spindle design. 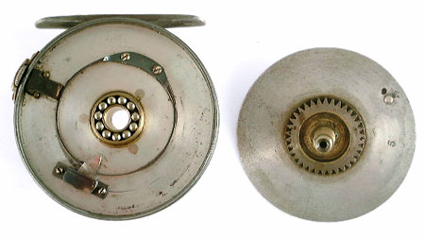 Given Hardy’s well known policy of making the ‘Perfect Reel’ for their customers – it is possible the new spindle design was a development aimed at reducing wear between the spindle and its bearing bush – therebye reducing or eliminating the ‘wobble’ of the spool on its spindle which occurs after long years of service. The second speculation questions why so few of these tapered spindles have been found? It may be because Hardy’s made relatively few of them for the purpose of ‘Field Testing’. These would be assembled into a variety (possibly) of fly reels which would then be gifted to certain well known anglers who in turn would use them for a set period of time before returning them to the factory for determination of the spindles’ ‘wear characteristics’. I could speculate further – but it may be that readers of this article may wish to add their own thoughts on this subject, hopefully they will and I’m sure the editor will be pleased to add them for the benefit of everyone. 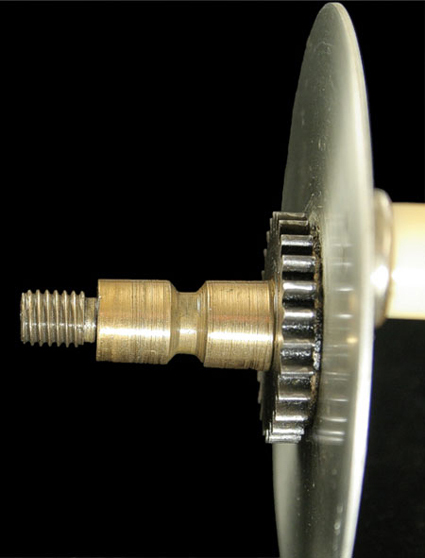 I would encourage those who read this addendendum to the original article – to look again at their reels and if you should find a ” Tapered Spindle” amongst them – then please report the details to the Editor of this site. 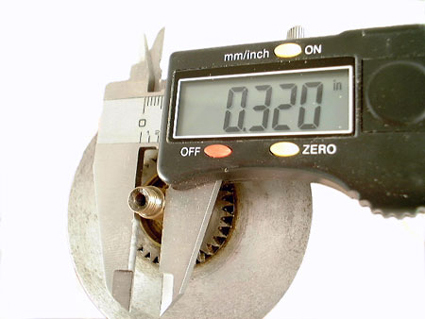 This entry was posted in Hardy Tapered Spindle Reels. Bookmark the permalink. Pleased to see your post. I know there must be more of these reels somewhere – I’m particularly interested to hear of one being found in a wide drum Perfect. If you could publish some ‘photo’s of those you’ve handled it may encourage other collectors to examine their reels so we can build up the information for all to share. Hi Ted, after reading your article, which I found very interesting, I’ve checked my small collection for any reels with tapered spindles. I found one in a 1912 check 3 5/8″ Perfect. You might be interested to hear that I also own a 1912 check Bouglé that, unlike the example you posted, hasn’t got one. Hi Ted, this is the first time I read your article. Interesting you mention this as I was always intrigued in the tapered spindle of my early 1912 salmon (3 3/4″) Hardy Perfect. Email me and I will send you pics.